In this era of cut-throat competition, Hi-Tech implements cutting-edge technology and delivers excellence. The automotive industry faces new challenges every moment with its ever-increasing demands in advanced features and security. 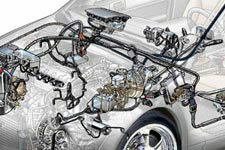 Over a period of time, integrated electronics has become a major part of the automotive industry. Hi-Tech’s innovative electronic services enable its customers to spend less energy, time, money and resources in upgrading the existing functions or developing new functionalities. This helps speed up the development phase. Hi-Tech is into offering services that include electronic development tasks. The company supports preparation of E/E architecture particulars and developing software & hardware to merge into the vehicle. With years of experience in working with organizations into engineering, Hi-Tech has gone on to understand the nuances of architecture, design, implementation, and matters of or related to vehicle electronics. Request free quote on electrical and electronics system engineering services.